For the time being our weekly column will appear here! For many the JRPG has lost its way in recent years. While titles like Final Fantasy have sped up their combat and lost the world map in an attempt to woo the western market, smaller development houses in Europe have been paying homage to the classic gameplay of old Japanese games. Look at the surprisingly deep Rainbow Moon on the PSN last year.. 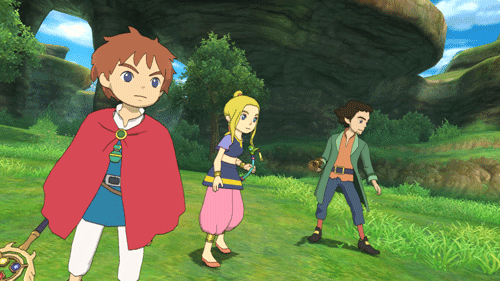 Tipped to buck this trend is Level 5’s Ni no Kuni: Wrath of the White Witch (12+, PS3, £39.99), released today. Stepping out with animation wizards Studio Ghibli is a potential masterstroke in lots of ways – well known and loved by western audiences, Studio Ghibli don’t compromise on story in their animated films, and this alliance leaves Level 5 the creative freedom to express themselves through the game’s exploration and combat. Expect emotional immersion rarely seen this generation. The darker side of animated films can be found at the large plastic castle, and Disney’s forthcoming film ‘Wreck-it Ralph’ is to get its own game. The title character is a retro arcade character who leaves his cabinet at night, joining the other games. Those of you who have been enjoying the sublime Sonic and All Stars Racing Transformed kart racer will have spotted the character, and racked your memories of Sega classics for his appearance. You’re not mistaken, he is a new invention. The government’s tax breaks for the creative sector comes into effect in April 2013.This should lessen the risk of producing new games and enable them invest more in staff, letting Scottish companies rely on big producers less. It should also help graduates to start their own wee companies. At a time when the rest of the Arts and Culture are being squeezed, this could be a shot in the arm for Scotland’s many games companies..
Geordie Gareth has been away from Scotland too long it would appear, he’s obviously missing the nightlife..